When you walk into chinked log cabin that is Leiper's Fork Distillery, a small sign scratched with chalk reads: "Whiskey...because no good story every started with a salad." Then you're greeted with a firm handshake and a cocktail proudly mixed with their own pre-Prohibition-style Tennessee whiskey. Let me state at the outset that I'm not a whiskey gal. I haven't developed the balls for it. Excuse me, I meant to say "palate." While I enjoy the warming sensation of the spirit after a few seconds, it's the incendiary onset that I cannot handle, as it equates to the burning of Atlanta in my mouth. That upsetting quality aside, what I enjoyed immensely about visiting Leiper's Fork Distillery was the lovely rural setting of rolling hills and equestrian farms and the deep history of the place. The cabin where you are greeted by a gracious staff member (chances are a singer-songwriter from Nashville with a penchant for good whiskey), is nearly 200 years old. The 640 acres of land was granted to a man named Robert Hayes who fought for the Continental Army in the Revolutionary War. 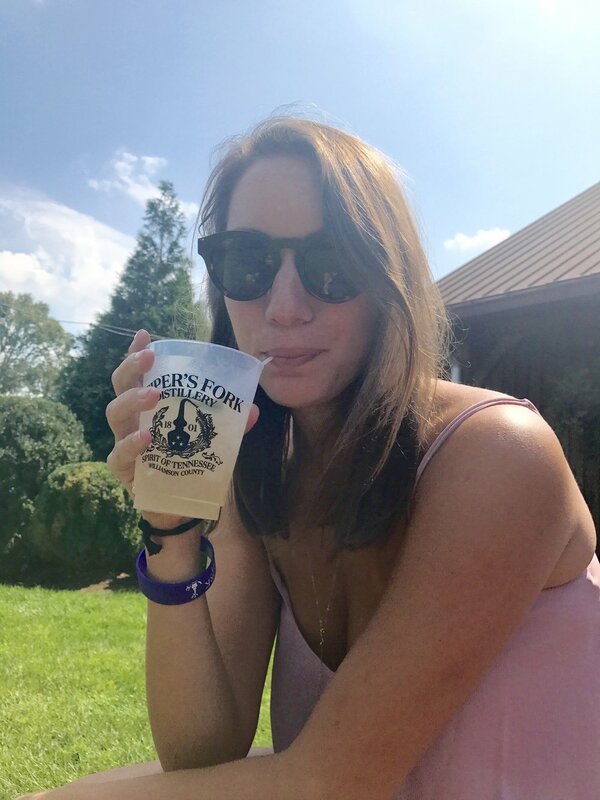 These days, family-owned and operated Leiper's Fork Distillery uses the farm to grow as many ingredients for their whiskey as possible. What they can't grow themselves, they have delivered fresh and local. 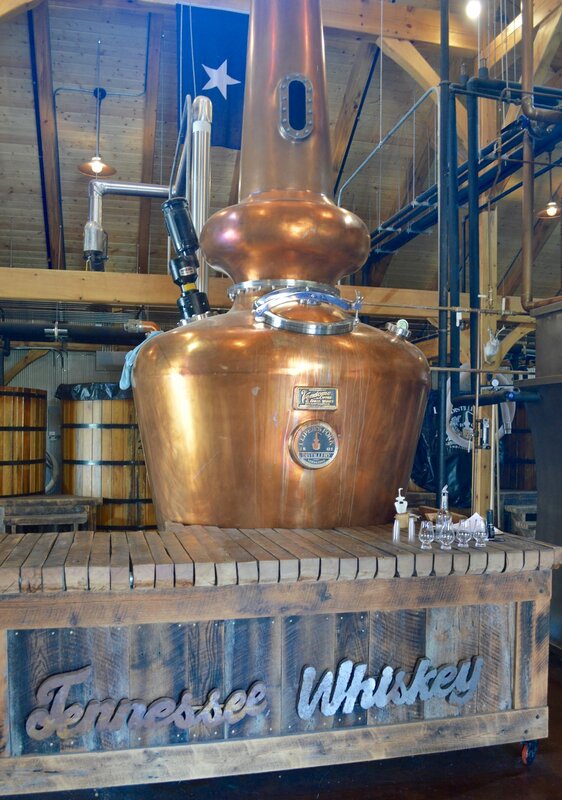 The distillery is constructed around "Ginger," a beaut of a swan-neck still made in Louisville, KY and aptly named after the stunner from Gilligan's Island. Behind Ginger we could see enormous casks constructed of Louisiana Cypress (already saturated so it doesn't absorb anymore liquids) where the mash ferments before it heads to the still. We were even able to see the mash bubbling in its fermented state. After learning about the painstaking detail that goes into the production of small-batch whiskey, we were ready for a taste. Let me tell you, when this much focus goes into a product, from "grain to glass," as they say, it doesn't disappoint. And I don't even drink whiskey. Whiskey gets its color from the barrel- it goes in completely clear! The phrase "blind running drunk" is a moonshining term harking back to the misfortune of going permanently blind from drinking the "heads" (the first 2 gallons from the still), which contain delightful substances such as formaldehyde and acetone. Tennessee passed state prohibition in 1910, about ten years before national Prohibition. Before that, there had been 30 distilleries in Tennessee. Proofing means "to add water." The term originates from proving clear whiskey is worthy of buying and is not watered down. This was accomplished by placing gunpowder in a spoon, pouring whiskey on top, and lighting it on fire. If the gunpowder exploded, the whiskey was good for sale. This was a common sale method of many farmers who overproduced grain and got rid of it in whiskey form.